This free toy store WordPress theme is colourful, clean, energetic and gorgeous with a great use for toy stores, kids clothing, shoes and other relevant eCommerce shops and businesses. It is extremely easy to manage and understand that even a novice with no coding knowledge can also use it; with detailed documentation provided, using it to its maximum potential is further easy. This responsive theme looks beautiful on any device be it mobile, tablet or desktop. It is rigorously tested on various browsing platforms and it loads on all of them without glitches. 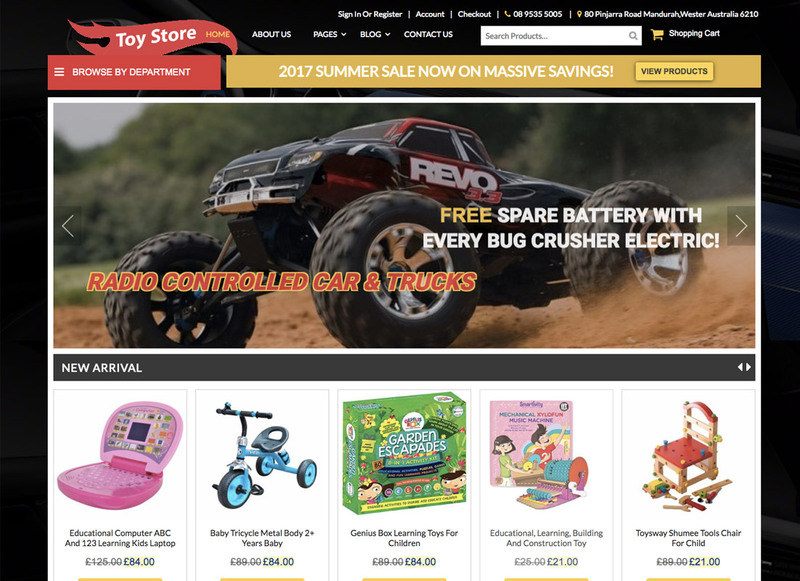 The free toy store WP theme is compatible with the latest WordPress version and is written in clean and secure codes yielding a bug-free site. Only building a website is not enough, it should also have a good search engine ranking to get a decent traffic and this is taken care of by its SEO factor. It can be easily translated into numerous languages with necessary files packed inside the theme package. It will give a perfect professional look to your website without investing anything. As this toy store WordPress theme is a free one, it does not come with any plugin. But you can always integrate it with any plugin as it is seamlessly compatible with them. Policy Includes all the taxes.